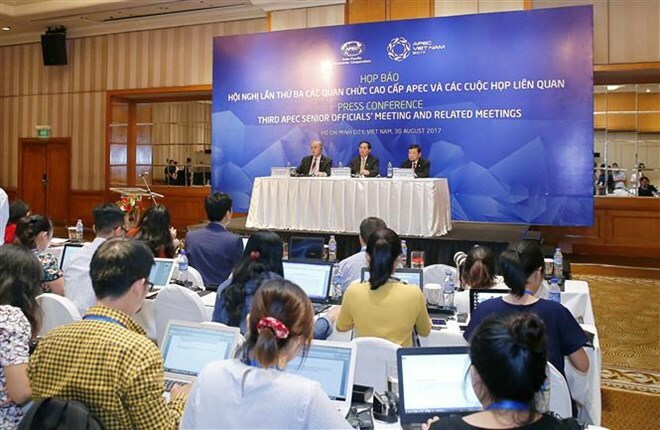 HCM City (VNA) – The third APEC Senior Officials’ Meeting (SOM3) and related meetings wrapped up in Ho Chi Minh City on August 30 after 13 days of working. Addressing a press conference the same day, Deputy Minister of Foreign Affairs Bui Thanh Son, APEC 2017 SOM Chair, said the SOM3 and related meetings has the largest scale in the APEC Year 2017 with nearly 80 meetings and 3,000 delegates, including ministers, deputy ministers of APEC member economies, and representatives from APEC observers, international organisations and businesses. He reviewed the SOM3, the High-Level Meeting on Health and the Economy, the Symposium on Promoting Economic, Financial and Social Inclusion in APEC and the SOM Dialogue on Regional Trade Agreements (RTAs)/Free Trade Agreements (FTAs) in HCM City, along with the Food Security Week and the High-Level Policy Dialogue on Enhancing Food Security and Sustainable Agriculture in response to Climate Change in the Mekong Delta city of Can Tho. The SOM3 and related meetings took place in the context of bright prospects for global and regional economy and trade, Son said, noting that the regional economic growth rate is forecast to surpass that of the global economy. However, the widening development gaps between economies and within each economy and the occurrence of non-traditional security challenges such as natural disasters, diseases, population aging and climate change require the APEC to maintain its growth rate while strengthening its cooperation as well as connectivity to benefit people and businesses more practically. The meetings mulled over a range of issues, from human resources development and structural reform to support for small and medium-sized enterprises (SMEs), anti-corruption, natural disaster response and business environment improvement. According to Son, the APEC economies affirmed their determination to bring pragmatic and specific interests to each economy, community and the business circle. Therefore, inclusive growth was debated at meetings of APEC committees and groups, covering economy, finance and society. Vietnam’s initiative to organise the Symposium on Promoting Economic, Financial and Social Inclusion in APEC has received support and active participation of other APEC member economies and international organisations, Son said. This is also the first of its kind held by the APEC in an effort to combine policies and actions of its committees and working groups, he added, stressing that the symposium underlined the need to develop an APEC action plan on inclusive growth which sets forth specific norms, inter-sectoral solutions and measures to improve legal and institutional capacity to boost inclusive growth. Outcomes of the seventh High-Level Meeting on Health and the Economy and the Food Security Week and the High-Level Policy Dialogue on Enhancing Food Security and Sustainable Agriculture in response to Climate Change have also significantly contributed to the APEC’s goal of economic, financial and social inclusion, the APEC SOM Chair said. He said the delegates sought measures to increase finance for the health sector, expand the medical network, narrow urban-rural development gaps and facilitate the operation of small-scale enterprisesin the farming sector. The APEC economies were resolved to boost regional trade liberalisationand investment in rural areas through the implementation of Bogor Goals by 2020 and discussed how to prepare for the post-2020 APEC Vision, Son said. He stressed the need for the APEC member economies to continue exchange experience and improve capacity to maximise the RTAs and FTAs, especially developing economies, in order to accelerate the negotiation, signing and implementation of the deals. The APEC senior officials approved three important documents, including the Framework on Cross-border E-commerce Facilitation, the Best Practices on Promoting Supporting Industries in Asia-Pacific Region, and the Monitoring Framework on the Supply-Chain Connectivity Framework Action Plan (SCFAP II). Such outcomes have not only satisfied the interests of the APEC member economies and businesses but also met Vietnam’s socio-economic development requirements, including those in sustainable development with people as the centre, Son said.